"Be careful with this one! It's so robust and flavorful that your guests might fill themselves up on it before you have a chance to serve the main course!" Combine basil, pine nuts, ricotta cheese, and salt and pepper to taste in medium size bowl. Place bowl in refrigerator. Coat eggplant slices lightly with olive oil. Place in large saucepan over medium heat, apply pressure to release moisture from eggplant. Remove eggplant sliced when tender. Allow slices to cool to room temperature. 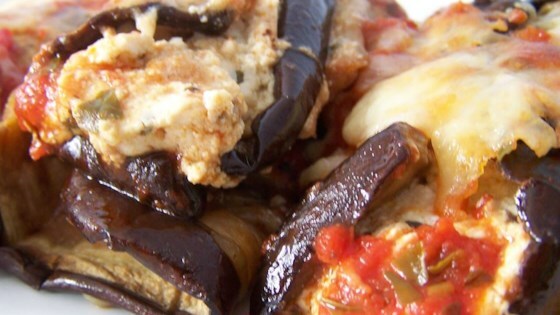 Spread a dollop of ricotta mixture over eggplant; roll up the slice of eggplant. Spoon marinara sauce over each rollati and sprinkle with Parmesan cheese. I changed this a bit by putting in a 13 x 9 and topping with spag. sauce and mozzerella and baking for 35 min. at 350 deg. WOW was this awsome!! This recipe is fabulous! I use pre-breaded eggplant cutlets form the local Italian store which cuts the difficulty to almost nothing. You won't be disappointed and neither will your guests! I made the eggplant ahead of time so it was cool enough to roll up. Everyone loved it.